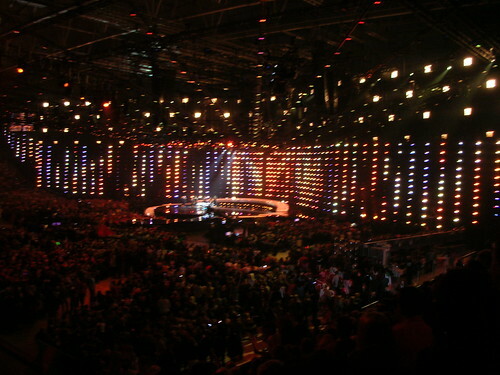 Who will win Eurovision 2010? I was there for semifinal! Who will win? Who will win? Statisticians at MIT predict Azerbaijan while Cinta large scale newspaper poll predicts it will be Germany. The poll on facebook is currently showing Turkey in the lead. Everyone has an opinion, so as a good blogger I went last night to check out some of the entries myself. Okay I can’t take full credit, I must thank NRK to donating the tickets to our center. We received 10 free tickets and gathered the girls together for an exciting night out. They donned their makeup and their heels, did their hair and hopped the bus (??!!??) to the Telenor arena. Yes I did say bus, the local transportation arrangements were excellent with busses going every 3 minutes or so at the rush time for the show. I had my camera of course. I felt very cheeky sneaking it in, but when I got in I noticed they weren’t too strict about it because there were lots of cameras around. I am afraid our free tickets weren’t exactly first row. Actually I have a suspicion that the front row areas are reserved for guests of each country as they are very neatly divided into the different countries groups…but I did the best I could to capture the atmosphere anyway. I found it very hard to decide when it came to voting for my favorite. I noticed that when I watch the show on tv I am a lot more critical to the presentations. When I was actually there they all seemed good in their own way, and I realized that of course it is the ‘best’ each country has to offer. I realized a lot of time and work and planning goes into each act and I was affected by the enthusiasm of each countries supporters. The biggest surprise to me was that Sweden didn’t go on, as I have heard the song before and thought it was a really good performance. 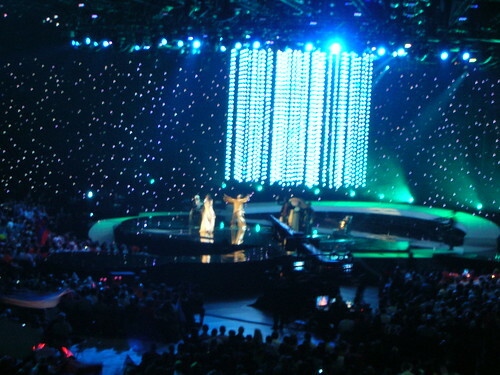 The ten finalists who go on the last competition on Saturday were: Georgia, Ukraine, Turkey, Israel, Ireland, Cyprus, Azerbaijan, Romania, Armenia and Denmark. So who did I vote for? As a good democrat I shouldn’t tell, but I will. I liked two performances better than the others. Sweden, which sadly didn’t make it to the final and Georgia which did. So what do you think? 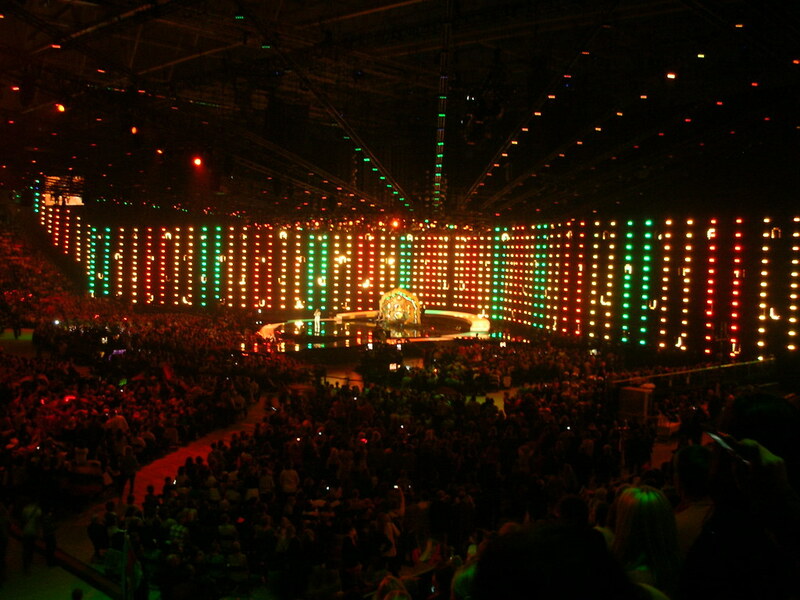 Who will win the Eurovision 2010 Song contest??? To learn more of the history and another point of view on the Eurovision experience check out RennyBA’s Terella! Best song: Israel .. but not the winner, I guess. Best popsong: Azerbaijan .. if she could sing better English. I’m afraid in England we tend to take the song contest with a huge pinch of salt (perhaps because, in recent years, we’re always towards the bottom of the voting list). We watch it for the humour rather than the tunefulness! That’s really cool! I love the pictures and the light. I really have to listen to the different songs now! Nice to read the semi-final I missed!!!! I find it’s nice to read your vision of the show in live!!! It must be so different than watching on TV! But I wouldn’t want to miss it for nothing yesterday night as it was in Oslo, the town of the OBG!!! I will visit with my husband very soon! I find the German singer very nice and fresh!!! and only 18!! !She’s very talented!!! I really like the singers when they sing in their own languages. Did Germany sing in German? I think that when they sing in English I tend to check them against singers here in the US, which is not fair, so I still wish they would not sing in English unless they moved to this country for a career. When they sing in English I can’t remember which country I liked since they all sounded the same. I would be fun to find out how many countries sang in English out of all the countries? Or is it a requirement that they do sing in English maybe? I’m glad you liked the Swedish contribution – I heard that they were only 1 point from being in the final. Tough for the poor girl to be the very first one that don’t make it during all those years! You guys are quite lucky to be there. I wanted to see it live but I have exams so I’m just contented watching Eurovision on TV. we don’t get eurovision in california. but i liked georgia’s performance, and since you liked it too, i will ‘vote’ for that one. it looks like an amazing venue. i love all the lights and glitz. i’m sure you had fun.